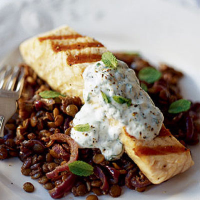 Succulent salmon fillets are served on a bed of delicately spiced green lentils, with a fresh, minty yogurt accompaniment. Heat 1 tablespoon of the oil in a medium pan, add the onion and cook for 2-3 minutes until softened. Add the spices and cook for a further 2 minutes. Stir in the stock, bring to the boil then add the lentils. Cover and simmer for 25-30 minutes, stirring occasionally, until the lentils are tender and the stock has been absorbed. Add a little more stock if necessary. Season to taste. Meanwhile, heat the remaining oil in a large non-stick frying or griddle pan. Place the salmon fillets skin-side down in the pan and cook for 4-5 minutes until the skin is crisp. Turn over, season with black pepper and cook for a further 4-5 minutes until the flesh is opaque and just beginning to flake. Spoon the lentils onto 4 plates and place the salmon on top. Serve with a spoonful of yogurt mixed with the chopped mint and lightly seasoned with black pepper. The lentils would also make a great accompaniment to organic chicken breasts. A crisp, white wine with gentle citrus flavours, that will be a good match for this dish.